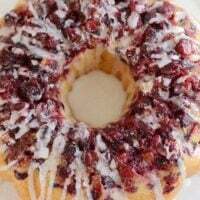 This glazed cranberry lemon cake is an absolute showstopper with its lovely drizzly glaze draping over a layer of fresh cranberries and tender, soft lemon cake! 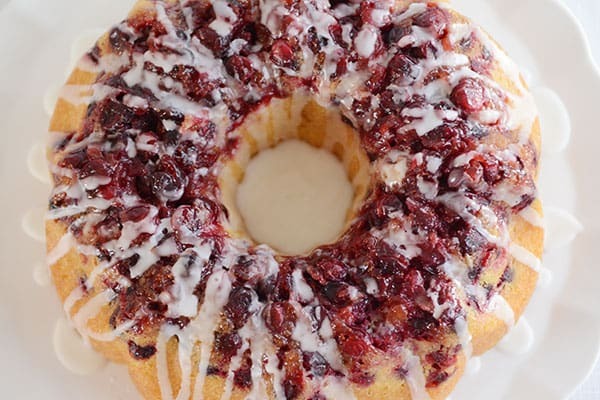 Since I’ve already told you how much I love cranberries, is it really a surprise that my self-proclaimed favorite dessert of the holiday season is this glazed cranberry lemon cake? Based on looks, this cake easily scores 10 out of 10. I mean, look at it! That beautiful contrast of fresh, vibrant cranberries next to the tender, lemon cake is pure beauty. Thankfully, the gloriousness doesn’t stop there. 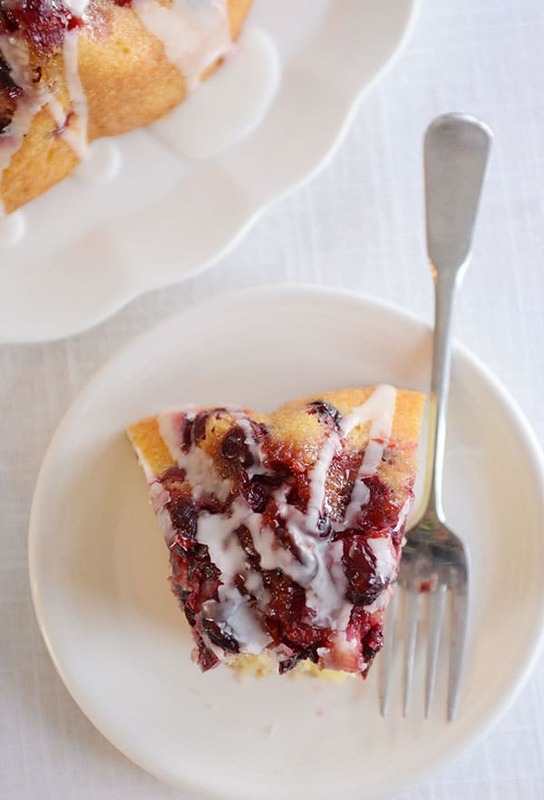 Even though some pretty desserts often result in taste bud disappointment, this cranberry lemon cake is out of this world. Perfectly soft and tender, the lemon cake itself is perfection. The bright hint of lemon comes through without overpowering the cranberries. Admittedly, it would take a heck of a lot of lemon to overpower the somewhat strong flavor profile of tart cranberries, but rest assured that the flavors of this cake compliment each other without competing. This truly is the perfect cake for holiday celebrations. And just to dispel any worry or confusion, let’s talk bundt cakes for a second. I have a 35-year old bundt cake pan my mother-in-law handed down to me several years ago, so I’m not really in the know about The Best Bundt Cake Pan to own these days. For certain, the main key to a bundt pan for this recipe is that it probably needs to be at least 10- or 12-cups in capacity. I don’t want overflowing cake hate mail. Personally, I have not tried this in a smaller bundt pan, a 9X13-inch cake pan or divided between a couple loaf pans. However, if you decide to experiment, keep an eye on quantity of cake batter and/or baking time. I don’t want burned cake hate mail. This cake has personality, good looks, and taste going for it. If you’re thinking “chocolate” – well, you and I are soulmates. I’m very reticent to throw my weight (haha?) 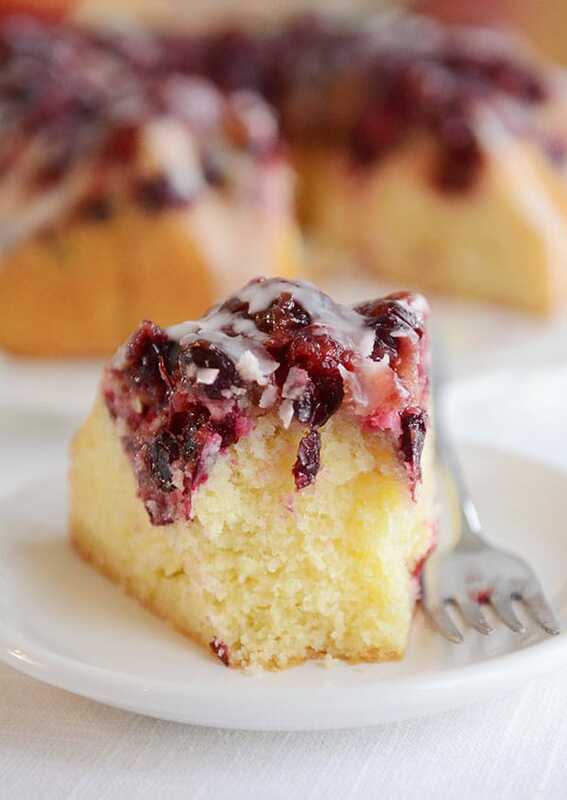 behind a non-chocolate cake, but in the case of this cranberry lemon cake, the praise is well deserved. I love it, and can’t wait to serve it during the holidays for years to come. Of course, I’m not going to stop you if you want to nix the glaze and drizzle it with a little dark chocolate ganache or something equally decadent. This cake would make a fabulous addition to any holiday spread you serve this month. Or simply for a special dinner or get together with friends or family. And next year, don’t discount it for a viable dessert addition at Thanksgiving. In the end, his distaste of softened, jam-like cranberries worked in my favor. I won the fork battle of who got to claim his barely eaten piece of cake. It was worth nearly losing a finger in the process. This cake is screaming for you to make it! Can’t wait to hear what you think. Preheat the oven to 350 degrees F. Generously grease a 10- or 12-inch bundt cake pan with butter - making sure to grease all the nooks and crannies really well. Sprinkle the brown sugar over the bottom of the pan, then layer the cranberries evenly over the sugar. In a large bowl (or in the bowl of a stand mixer), combine the granulated sugar together with the zest from the lemons. Rub the zest into the sugar with your fingers until the sugar is infused with the lemon fragrance. Add the butter to the bowl with the lemon sugar and, using the paddle or whisk attachment on the stand mixer or a handheld electric mixer, beat on medium-high speed until light and fluffy, about 2-3 minutes. Add the vanilla and the eggs, one at a time, mixing and scraping down the sides of the bowl as needed. In a liquid measuring cup, combine the buttermilk with the 2 tablespoons lemon juice. Add 1/3 of the dry ingredients. Mix until just combined and a few dry streaks remain. Add 1/2 of the buttermilk/lemon mixture. Mix again until just combined. Add another 1/3 of the dry ingredients and mix until just combined, followed by the remaining 1/2 buttermilk/lemon juice mixture. Mix. Add the final 1/3 of the dry ingredients and mix until just incorporated. Spread the batter carefully into the prepared pan over the cranberries. Bake for 45-55 minutes or until lightly golden on top and just set. Transfer the bundt pan to a wire rack and let cool about 10 minutes. Invert the cake onto a serving platter, tapping lightly so the cake falls out. Let the cake cool completely. For the glaze, combine the powdered sugar with the 1 1/2 tablespoons lemon juice and whisk until smooth. Add additional lemon juice or milk for a thinner consistency, if needed. Drizzle the glaze over the cooled cake and let set, 5-10 minutes, before slicing and serving. I've only ever made this cake using fresh cranberries but I suspect frozen would work well, too. You'll need 2-3 lemons for this recipe - make sure to zest the lemons before juicing them! As always, don't overmix that batter! Follow the instructions and mix each addition of liquid/dry ingredients until just incorporated. Next Post » 4 Reasons to Sign Up for My Exclusive Newsletter TODAY! Don’t judge, but we have a boxed lemon cake sitting in our pantry. Do you think we can use that instead? 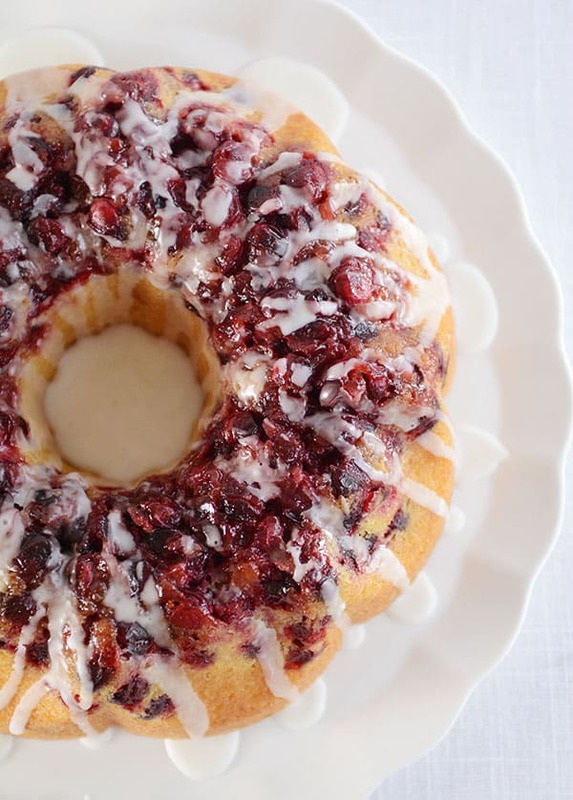 Dress it up with the same cranberry and lemon glaze. Just made this and it was fantastic! I couldn’t wait to taste it so took a small slice while it was still warm. Love the lightness of the cake and the cranberries were not overly tart. I will definitely make this again. I made this last night for a family gathering and everyone loved it! The only problem I had was that when I flipped the cake over onto a plate, some of the cranberries stayed in the bottom of the pan. I thoroughly buttered the pan beforehand too. Do you think I need to try waiting longer than 10 minutes to flip it out of the pan? Thanks! This cake was an instant hit! Will make it again soon! Really great in a regular cake pan if you don’t have a Bundt cake pan. I’m sorry, I haven’t ever tried that so I don’t know! Can you make this cake ahead of time? If so, how many days? I’ve only made it about 24 hours ahead of time, but it worked great. Hi Hello: Love Love this cake! It’s an OMG at the first fork full. I made it for a winter fest gathering. Should have made 2. Now that I am on the brink of a summer fest gathering I was wondering if substituting blueberries or raspberries or a combo of both, for the cranberries was a possibility. Just to summer it up a bit!! I also had a crazy idea about somehow trying to use mascarpone like fill the bundt pan 2/3 of the way with batter then put some spoonfuls of mascarpone then the rest of the batter. Will it change the consistency of the batter as it bakes? ie: making it thinner ( just trying not to ruin perfection.) But it sounded like it would taste good, especially with the lemony deliciousness of the cake. What do you think?? Hi Lisa – you’ll probably have to experiment as I haven’t made any of those changes. Sounds delicious, though! I made this to take to a family dinner, following every single step as written in the recipe to ensure it turned out. The end result was spectacular and not only did it look gorgeous, but it tasted delicious! Thank you, this one is a definite keeper. Thanks for sharing this recipe. I was wondering how you get your ounce conversations? When I look at King Arthur’s chart, 2 1/2 cups of flour is 10.625 ounces of flour. I want to make the recipe using a scale for accuracy, but I’m not sure what the right amounts are? Thank you. Hi Dani – a lot of different sources use different amounts (King Arthur Flour weight measures differ from Cook’s Illustrated – both are reputable sources). I follow Cook’s Illustrated guidelines, which is 5 ounces of flour per cup. But I encourage all my readers to use weight measures per the recipe instead of one overall standard. Does that make sense? I tested this recipe using the weight measures that I’ve listed in the ingredients. In the name of science, you know, to improve the human condition and all, I felt it was my duty to try this in mini loaf pans. It fit perfectly in five of them! I put the filled pans on a jelly roll pan in the oven but there was no mess. It did help make wrangling them in and out of the oven easier, though. I rotated them at 25 minutes, baked another ten, and they were perfect! And perfectly delicious, too. Also, I used frozen cranberries (still frozen when they went in the oven), so that’s likely why it took a bit longish to bake. Thanks for yet another divine reason to up my calorie count! Haha, I love science experiments like this. Thanks for taking one for the team and for all of humanity. SO happy to know this cake recipe transitions well to mini loaf pans! How are the leftovers of this cake? Or can I make the cake the night before needed and glaze it just before serving?? Thank you! I served the cake the day after baking and it was fine. Just store tightly covered and glaze before serving. Wow wow wowwwww. This cake is gooooood. I previewed the recipe yesterday as a test run for Christmas Eve dessert. I was worried because the outer edge of the crust seemed a little crunchier than I expected, so hubby and I decided to cut into it for a taste test just in case. It was EXCELLENT. The combination of lemon and cranberry is one that I never considered before, but I’m sold. I’ll definitely be making this cake again! I took this cake to a church Christmas dinner tonight and was very pleased! This cake just says “Christmas” to me in looks and taste. 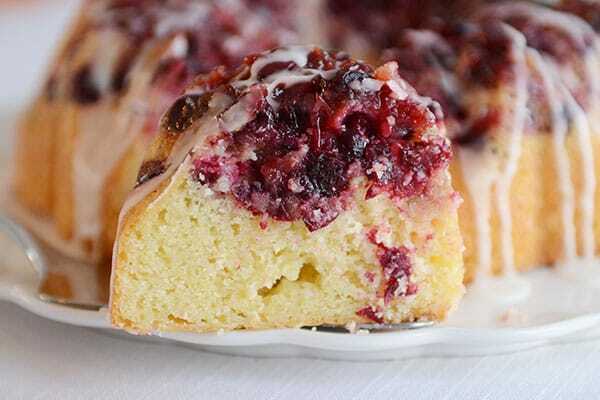 The cranberry and lemon with the glaze blend so nicely together. Like your son, I’m not a cooked fruit fan either, but this was still very yummy. Against your warnings, I made it in a bundt pan just over 9″ and it did not overflow. I did have a few spots that stuck on the sides, but I just used that as my sample bites and covered the spots with the glaze as best I could! Thanks for another great recipe, Mel! This cake was delicious. Took it to my Bible study home group and it vanished. I did slather the bundt pan with significant butter and I still had difficulty getting it to release. When it did, some small pieces of cake remained in the pan. Yikes! Solution needed! So I made a bit more of the glaze, used the glaze as glue in the sparse spots and pressed some additional cranberries into the areas and all was well! I made this for my church small group today. It was a showstopper! Not only did it taste absolutely divine, it looked just like the picture! It was a work of art! My parents have now requested this cake while I visit over the holidays. Thanks for another knock-out! I just made this, exactly as written, and it’s amazing. Family loves it. No hate email coming from me – just love!!! I made this beautiful and delicious cake yesterday for my bible study brunch and it was a show stopper. Mine looked just like the pictures and was so yummy. Thank you for another amazing recipe. Just wanted to report that I decided to try an orange version, subbing all the lemon juice and zest for orange (well, actually those little cuties since I have bags of them on my counter – it took about 6 cuties for the zest but only a couple-worth for juice since they were so juicy). It was fantastic! Such a festive, Christmasy dessert! I love all your recipes and know that I can make it for a ward party (in this case, even with my alterations) or guests or to give away without even trying it first myself. I made the skillet chicken fajita nachos last week (with leftover turkey) and they were another big hit in our house. Thank you, thank you, again and again for your wonderful blog and your amazing recipes! Oh! And the honey garlic chicken. Made that on Sunday and everyone (even the 15 month old) gobbled it up! Love your stuff! I’m Swedish born and think the traditional Swedish lingonberries would work wonderfully with this cake! The only problem I have is finding lingonberries in the states. I can get the jarred preserves but not sure is this would turn out well? I’m not sure how well it would work with jarred preserves since I haven’t tried it – I’m afraid they might stick a little bit more to the pan, but you could definitely experiment! This is such a great idea. I like cranberries as well, especially in cakes. Yours looks amazing. Hey Mel, this cake looks amazing, but all the stuff you make is awesome! This looks SO delicious and is currently cooling on my counter. Can’t wait to eat it! Also – your serving plate is beautiful!! Do you mind sharing where it’s from? Hope you liked the cake! The platter is an old one I got on Amazon that unfortunately is no longer get available. Sorry! Bummer about the tray, but thanks for letting me know! And the cake was INCREDIBLE. And funny story – my mom walked in and said, “is that a Mel recipe?! I just saved that one!” And then my aunt walked in and said, “is that a Mel recipe?! I just saved that one!” We all had a good laugh and sang your praises with a belly full of deliciousness. Haha, that made my day! Hi Mel, This is my first comment which is pretty sad since I’ve been using your site and telling everyone I know about it for years. There are no words to truly thank you for the great service you provide to all of your readers. I know I’m not alone when I say that I can make any of your recipes without hesitation – they will be excellent! I’m thankful for all the work you do to make our lives easier, bring our families together and show love to others through yummy food. Thank you!. Anyway, I made this cake in mini bundt form and they are both delicious and adorable. I just used a pinch of brown sugar for each mini bundt and rough chopped the cranberries, then used about 1/4 cup of the batter (basically filled to the top), then baked for 12-15 minutes. I had to make them this way because there was no way I could make the whole cake and not taste it ahead of time. Ha! Can I ask how many minis came out of one recipe? Also did you have trouble releasing them? Everything about tshincake looks amazing and I’ll definitely try it for my Christmas Eve dessert ! 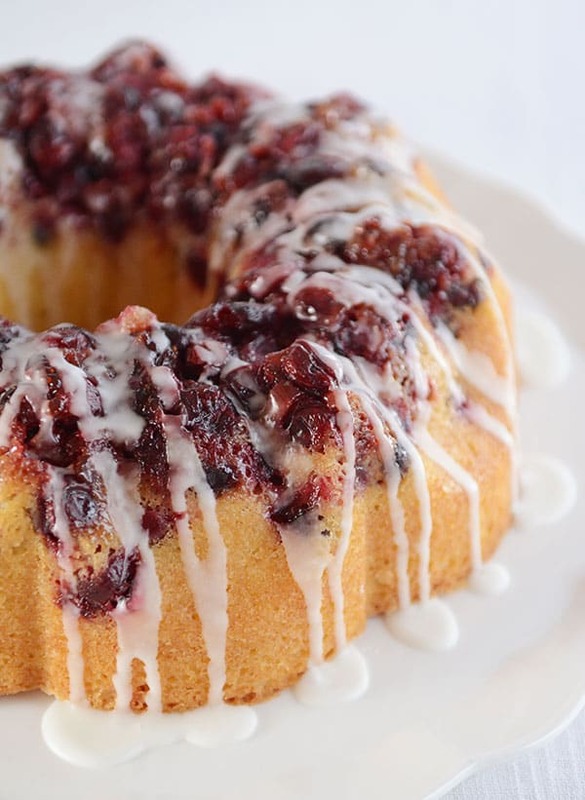 I was wondering how you think bleuberries would work if I wanted a beautiful and delicious bundt cake for the Summer ? Thanks Mel! I won’t be able to sleep until I hear your exciting news !! I made this in 2 loaf pans, baked for about 30 min and it worked out great. Loved the lemon/cranberry combo! You are a rockstar for making this in loaf pans and reporting back, Lavinia! Thank you! I’ve made this from Annie’s site for an event & it received rave reviews! As gorgeous as this looks, I just had to say that I don’t know that any cranberry recipe will ever top your Yummy Fresh Cranberry Salsa. That stuff is amazing. I took it to Thanksgiving, and it was the most popular appetizer on the table. The last time my husband brought it to work I got approximately a million recipe requests. Do you think this would convert well to cupcakes? The recipe looks scrumptious, and my Meyer lemon tree is abundant this year! That’s a great question; I haven’t tried it so I can’t say for sure but it’s definitely worth a try! I made a half recipe in a tall/deep Wilton 9 inch round cake pan and everything fit in the pan, no spill over during baking. Make sure to butter your pan very well as I had a few cranberries not release when I inverted the cake. I was able to tuck them back on top and I will cover them with glaze so you won’t be able to tell they stuck. My brown sugar topping didn’t burn and my cake baked for 40-45 minutes. I haven’t sliced it yet but the crumbs taste as good as my house smells. Thanks for a great new holiday cake. I’m so happy you tried this already, Kay! Thanks for reporting back! Yum! What a perfect way to use up those thanksgiving cranberries! Oh Mel!! The beauty of the season all in one cake!! Thank you!! Cant wait to make this!! Just beautiful!! I have some cranberries that need to be eaten. I am making this…today! Hooray for having finally gone to the grocery store and having a stocked refrigerator! It looks AMAZING and since lemon desserts are my favorite, I know I’ll love it. just curious will the cranberries burn or stick to the pan? I am tempted to try but already ruined bundt pans before so a little cautious. Also does anyone have ideas how to clean cooked egg off of pans – tried a recipe for baked eggs was impossible to clean it after several days of soaking. I didn’t have trouble with the cranberries sticking – but it is really important to grease the pan well. I’ve always used a scotch write scrubber to get eggs cleaned off the pans. Try pouring straight Pine Sol into the pan and letting it soak overnight…the egg “mess” should lift right off. I tried this once with a pan that I literally couldn’t even chisel off the burned residue from the bottom (I figured that if the Pine Sol ruined the pan I was going to have to throw the pan out anyway so what did trying it matter). Much to my surprise, the burned residue lifted right off in large chunks the next morning. My nordicware bundt pan holds 12 cups of water up to the top. Will the cake overflow? I occasionally use box mixes for cake, and I found out that my pan is definitely smaller than my mom’s. Some batter for Angel Food Cake came very close to overflowing. I rushed in with a last-minute cookie sheet. Without knowing the exact pan you have, I think it will be fine. My bundt pan is on the larger size, but this cake didn’t come close to overflowing and actually ended up on the small side (height-wise). I’d like to use leftover cranberry sauce (the real stuff, of course) as the cranberry layer. Do you think it will change the consistency too much? I still have fresh cranberries, but I want to use up the sauce first. I honestly don’t know. I think it has the potential to work, but since every cranberry sauce recipe is different, you’ll have to experiment. Good luck! +Oh, and I’ll use 1/2 c. cornmeal for part of the flour, lemon goes with cornmeal really well. I’m going to use my leftover homemade cransauce for this…..been wondering what I could do with it…….thank you Mel. You have outdone yourself my friend! And may I mention antioxidants galore. How far can this be made Mel? What about freezing? I am making this one today. I think it has the potential to freeze really well (minus the glaze…then just glaze before serving), but I haven’t tried it myself yet. It could be made a day ahead of time, if stored well-covered to prevent drying out. I made it and it’s delicious. However, I put the rest of the cake in the freezer to test that. I really don’t want to be making cakes the day before Christmas with everything else going on. Will try in a few days and let you know. lol well I’ll hold on to the dream! Did you say GLAZED, CRANBERRIES, and LEMON in the same phrase?